So, yes, it is only September and I’ve pulled out the pumpkin. Jocelyn made me do it with Pumpkin Oreo Donuts. Dorothy made me do it with Pumpkin Streusel Muffins. Heather made me do it with Pumpkin Cheesecake Brownies. Get my point? Pumpkin is popping up everywhere and I don’t want to be left behind. I already have bad memories from high school as the one without penny loafers. And Guess jeans. And a Benetton striped sweater. I’ve been watching all my friends day after day post pumpkin recipes. Then, while walking through Kroger, two cans JUMPED into my cart. I got a text from a friend saying she was headed out my way. For dinner. And dessert. So I figured I better just make some pumpkin for her. And what could be better than Pumpkin Cheesecake Cake? If you’ve been a long-time reader, you might know that cheesecake cake is something of a specialty around here. If you’ve never had a cheesecake cake, you’re in for a real treat. Cheesecake cakes consist of a layer of cheesecake sandwiched between two layers of traditional cake. Once the layers are stacked, they’re covered in frosting for a dessert that takes a regular layer cake to the next level. When I make this Pumpkin Cheesecake Cake, I like to make the cheesecake first. It bakes at a lower temperature, so it is easier to increase the oven temperature for the cake after the cheesecake is done than vice versa. All of the layers – cake and cheesecake – need to chill in the freezer for at least 2 hours before assembling the cake. Keeping everything nice and cold keeps the cheesecake from getting too soft while frosting the cheesecake cake. Decorate the cake as simply or elaborately as you like. Don’t be a hater on my cake decorating skills. I am NOT a cake decorator. This Pumpkin Cheesecake Cake is the perfect combination of fall flavors. 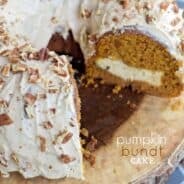 The pumpkin cake layers are so moist and full of warm spices, and the layer of cheesecake is tangy and delicious. I frosted this beauty in cream cheese frosting and topped it with a little bit of chopped walnuts and drizzled caramel. Pumpkin, spices, caramel, and walnuts…what more could you want in a decadent fall dessert? Get the full “how to” by watching my video below! Like my Pumpkin Cheesecake Cake recipe? You may also enjoy some of my other cheesecake cakes! Prepare springform pan by wrapping bottom of pan (outside) with double layer of foil. Spray pan with nonstick baking spray and line bottom (inside) with a circle of parchment paper. Meanwhile, boil a kettle of water to use later. Pour into prepared 9inch springform pan. Place pan in center of preheated roasting pan in the oven. Pour boiling water slowly into the roasting pan, until there is about an inch of water coming up the sides of the springform pan. When cooled, transfer entire springform pan into the freezer for several hours or overnight. I put it in the freezer for about 2 hours. **If using within 24 hours, feel free to just refrigerate cheesecake! Preheat oven to 350 degrees. Prepare two 9inch round cake pans by spraying generously with baking spray. Line bottom of each pan with a circle of parchment paper. Set aside. Beat pumpkin, sugars, applesauce and eggs until fully blended. Add in flour, baking powder, baking soda, salt and seasonings. Pour batter into prepared pans. Bake cakes for 30-35 minutes, until toothpick comes out clean. Cool in pans 15 minutes. Flip onto wire rack and cool completely. When cooled, wrap each layer in saran wrap and freeze for two hours, or overnight. **If using within 24 hours, just wrap cake in saran wrap and keep on counter. Beat butter and cream cheese for 3 minutes until smooth and creamy. Beat in vanilla, powdered sugar and heavy cream. 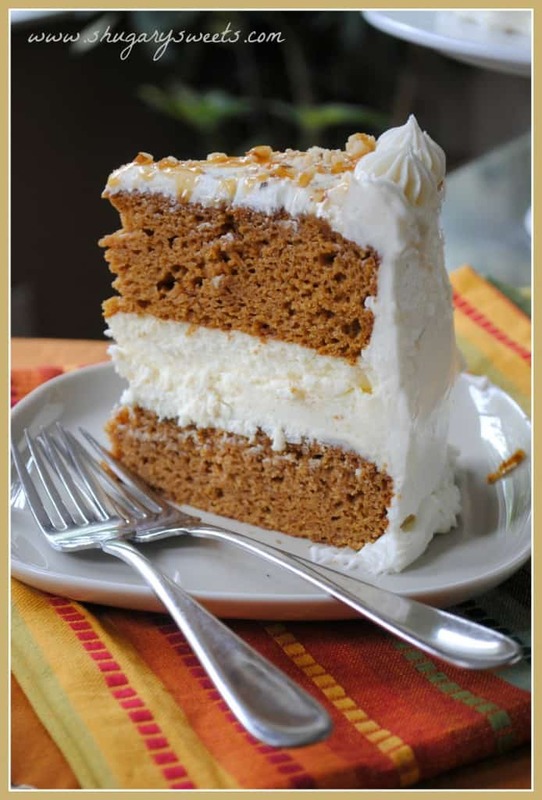 To assemble cake, lay one layer of pumpkin cake on cake plate. Top with cheesecake and second layer of pumpkin cake. Frost sides and top with a thin layer of frosting to apply a crumb coat. Refrigerate 30 minutes to an hour. 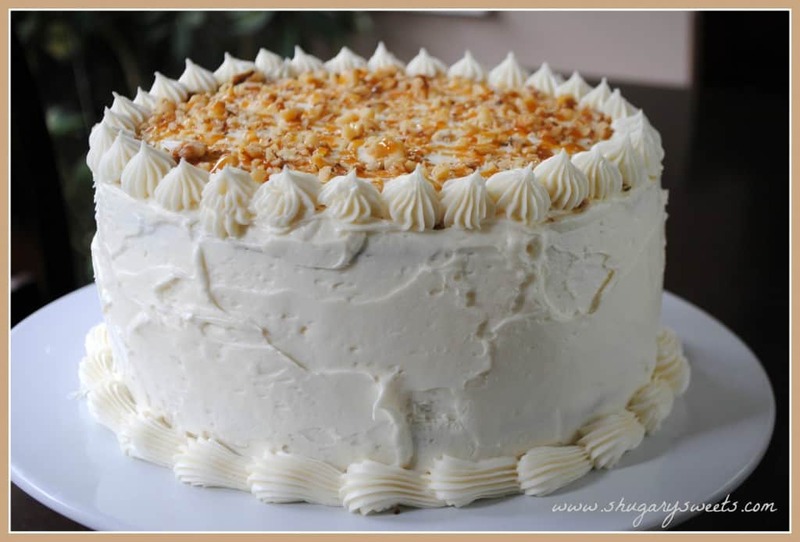 Remove from refrigerator and frost remaining cake, decorating using a tip if desired. Sprinkle walnuts on top of cake and drizzle with caramel sauce. I keep the cake covered in the refrigerator until ready to eat. Remove and allow to sit about 15 minutes before slicing. ENJOY! 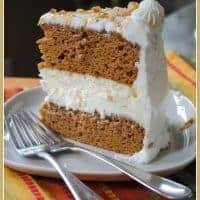 Today’s recipe for Pumpkin cheesecake cake was originally published on Shugary Sweets on September 9, 2012 and has been republished in October 2018. Aimee – it’s stunning! I have been on QUITE the pumpkin kick myself and my first recipe of the season is going out this week. And I think I HAVE to make your cheesecake b/c it looks so beautiful! Thank you Averie! I can’t wait to see your pumpkin recipe! AIMEE OMG. I feel like each recipe of yours recently, my jaw literally drops to the desk. This is unbelievable. EPIC. AMAZING!!!!!! A stunning, perfect cake. I have GOT to make something like this. You are a genius. I can’t even begin to tell you how happy looking at this cake makes me! You know I’m a pumpkin fiend, girl! And cheesecake! Ok, I’ll shut up now lol. Don’t shut up! Keep telling me what a genius I am. Go on…. I have bad memories of being left out of those cool clothes in Junior High too! Maybe that’s why I jumped on that pumpkin train and haven’t looked back this Fall!!! Haha! I love that it sounds like I invited myself to dinner…oh wait…I did do that:-) We had so much fun that night and I’m pretty sure it will happen again. Now this cake…oh boy…was it AWESOME!!!!! Let me tell you I enjoyed every single bit of my huge slice!!! And now I really wish I had more to dive into right now!!! Ahem. I like how you said JUNIOR HIGH. I said high school but you found it necessary to point out you’re younger than me?? hehe!!!! Oh my god, penny loafers. That totally brought me back. I had a heads in one, a tails in the other. Rad, dudette. Now, onto this cake. I mean so freakin’ awesome I can’t even believe it. I was JUST thinking, hey, cheesecake in a cake. And now you did it and I have a recipe. Yay! Ah yes, the heads in one tails in the other. I heard that’s what the cool kids did, but alas, I never owned a pair. This is gorgeous!! Cheesecake in the middle is such a fantastic idea. I’m definitely not hating on your cake skills, you’re much better than I am 😛 The rustic look is always best! Rustic. Perfect term for my cake decorating skills 🙂 Thank you! Your sweet comments always make my day! You have got to be kidding me. Pumpkin. CHEESECAKE. Cake?! Just plain WOW. I MUST TRY IT. But I hae to wait a little longer on the pumpkin, for my own sanity. Once I start Fall, no more 85 degree days allowed!! Oh my gosh, when I read your title I was thinking a cheesecake, not a cake, cake cheesecake! ! This looks out of this world!!! That is one beautiful cake! I think we’re all excited to break out the pumpkin! This is a gorgeous recipe. Last week, I was shocked with all the pumpkin that started popping up because I wasn’t ready. Now, it’s kinda getting me excited. YUM! Oooh breakfast dessert. I like the way you think! yay, you did a cheesecake cake! I have something kinda similar in mind for this fall… kinda similar but totally different! I’m waiting to make it since I’m trying to lose weight right now and I KNOW I can’t resist!!! Great job- looks totally yummy! Lori, I can’t wait to see what you come up with! Thanks for a great cheesecake recipe! I’m dying over how thick that filling is!! *droooool* Bookmarking this baby! Yay!! So glad you posted this recipe. I’ve been drooling over the thought since I saw your instagram photo. My two favorites… cheesecake and pumpkin cake! I’m sooo making this SOON! This is a masterpiece! Amazing for sure! Along with Scrumptious…Luscious…Gorgeous…Beautiful…Mouth-Watering…Impressive….do I need to say more??? MY OH MY! 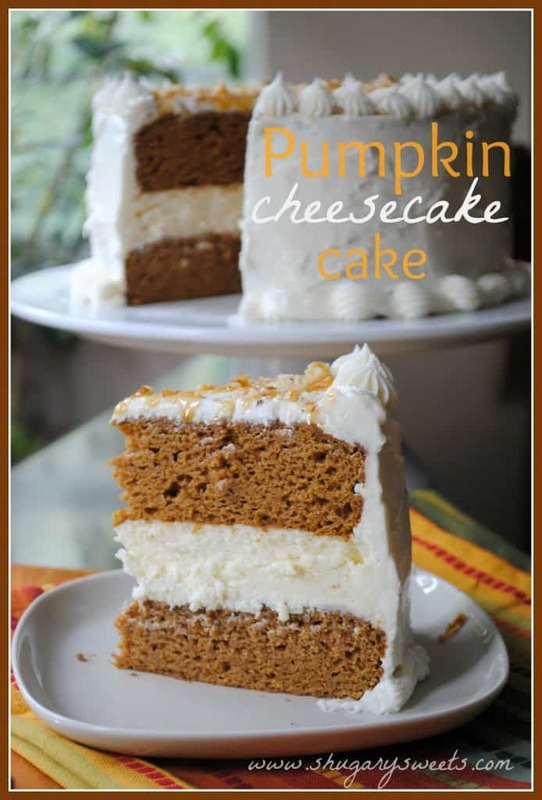 I am lovin’ baking up pumpkin dishes too….oh YUMMM-OOOOOOOO!!! Holy freaking cow. This looks amazing!!!!!! I’ll definitely need to make this cake this fall! I was the kid with the rolly backpack in middle school…guess I’ll have to be make up for my lack of former coolness by conforming and making this delicious-looking pumpkin cake now. Thanks for sharing! This cake looks beautiful! You may not think you’re a cake decorator, but I love the rustic look and think it looks lovely! Awww, thanks so much Tracy!! Seriously. Wow! That looks so amazingly delicious I feel like I should make that right this moment! You cake decorating skills are good! No hatin’ here 😀 I’ve pinned this so I can make this – and soon! Oh my! I am speechless! 2 of my favorite things! I may have to make it just for myself! Hee! Pinning away! So glad you shared this at Show & Share because I am featuring it tomorrow! Delicious looking cake! I am making it this fall for sure. Thanks for sharing. This looks so yummy! And beautiful too. Almost too pretty to eat! I just had to pin it! Hi there! I submitted a rpicee with picture. They had a huge voting war thing going on. They were going to take the top 3 entries, and I was in 4th. then they decided to take 4th because there was a tie in the top 3, so now we had 4 finalists. They re-created each finalists dessert, and judged them on taste presentation. And, I WON! I suppose you could use a boxed mix and a frozen cheesecake? Totally don’t recommend it though 🙂 You can do this!! Break it up into different parts. Bake your cake one day, freeze it in saran wrap. Bake your cheesecake one day, freeze it. Then make your frosting and combine it all!!! OH WOW! This is the first thing that caught my eye at Weekend Potluck! I just love to see what you bring each week, Aimee! This looks just fantastic! Isn’t it funny how things just jump in your cart at the store? That happens to me all the time. Thanks so much for linking up to the Weekend Potluck. By the way, I think your cake decorating skills look pretty fantastic, waaaay better than mine! Have a great week! Omg….i made this last night and it was a hit….my baby daddy that doesn’t like cake but likes cheesecake actually loved it! I’m so glad to hear that!!!! Sounds incredible! God bless you for this recipe! Made this last night, it was amazing! Perfect for the beginning of fall! Genius recipe! Thanks for sharing! Sorry, I just fixed it. The foil goes on the outside bottom of the pan and the parchment paper goes on the inside of the pan. Spray the whole inside with baking spray! ENJOY! i finally figured out that the foil went on the outside to prevent the water from getting in =) thank you! Oh My GOODNESS!! Wow – what an unbelievable cake!! I might just have to do this for Thanksgiving dessert! What a wonderful recipe. I cant wait to try it. As for your decorating skills, you have no reason to be shy about them, your cake looked absolutely beautiful. Keep up the good work. Oh my gosh!! This is so incredible! Might just have to make this for my FriendsGiving party! 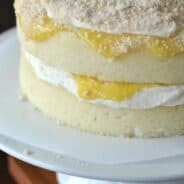 Is it necessary to freeze the cake overnight? Could I just put it in the fridge? We will be eating dessert around 3:30 or so. I guess I am not understanding what the point is of freezing the layers. I freeze the layers so I don’t have to make it all in one day. You can totally just stick it in the fridge! ENJOY!!! My best friend made me this cake as a surprise birthday cake. It’s the most delicious cake I have ever tasted!! 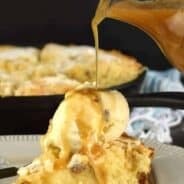 Thank you so much for posting this amazing recipe! Happy Birthday! So glad you enjoyed it (AND YOU didn’t have to make it)! Cranky here. This is not the initial recipe. The one I linked to off of pinterest had a box cake base. this is what I get for linkng to your page instead of printing the recipe. I’m not quite sure what you mean. My recipe is exactly the same as I originally posted. Maybe you saw a different recipe with a boxed cake mix for this? Cake turned out beautifully.. Everyone loved it!! Thanks for the recipe, it’s a keeper!!! I made this cake twice last week for my families Thanksgivings, there were loved so much by everyone. My family has also renamed the cake Princess Cake because the finished product is something a princess would eat. Thanks for sharing your recipe! This would be one of my favorites too!! I need to check my cupboard for pumpkin. Loved this, and so did everyone else! Thanks. So glad you enjoyed it! Thanks for the feedback!!!! Aimee – I made this again today and I was going to freeze it for Christmas. The pumpkin cake was raw in the middle even though I baked it longer than I did the first time I made it. I noticed that my baking powder was past the “best if used by” date, so I bought new powder and used it today. This is the only thing that I did different. Any ideas? I always remove my baked goods at the shorter side of the recommended baking time with success, but this time I went beyond the recommended time and it was still not done. Seeing that you made it before with no issues, I can only guess that maybe you made a mistake on the ingredients? I’ve made it twice now too with no problems! I’m not sure why it wouldn’t cook properly. 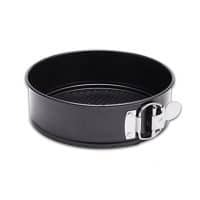 What size round baking pans are you using? Are they 8inch or 9inch? Even one inch makes a difference in adding/subtracting baking time!!! Just made this today, this cake is a keeper! My husband took his first bite and said whoa! I wanted to lick my plate but figured I shouldn’t do that in front of my mother-in-law. Will definitely make again and again…. Sorry, I’m new to baking homemade cakes :-/ I. Was wondering, is there a particular brand or type of applesauce to use? Also, if I freeze the layers, how much time do they need to thaw before frosting? I usually use Mott’s, but it doesn’t matter so much. I frost the layers while they are frozen! Glad it came out great for you!! Hi! I was wondering what size springform pan to use. Your directions say 9 inch, but mine are either 8 1/2 or 9 1/2 inches. I’m guessing the 9 1/2? I already made the pumpkin cakes and I’ve been having a really hard time not eating those on their own they smell amazing! Mine is a 9inch. But you can use whatever size matches your cakes. You can always go bigger and trim the cheesecake if necessary. I ended up using a 9 1/2 inch and trimming off the excess (to my husband’s delight!). The cake was amazing! Everyone at my daughter’s birthday party loved it and thought it was genius 🙂 Thanks so much for the recipe! You’re welcome! I’m so glad to hear you all enjoyed it! I appreciate you stopping back to let me know! I just made the cakes and do not plan on assembling for a couple of days. I wrapped the cakes with saran wrap and placed in the freezer. The cheesecake is cooling now and then I will place in the freezer for a couple of hours. I have a question though. Since I am not assembling for a couple of days do you remove the cheesecake from the springform pan and saran wrap it and return it to the freezer or do you just Saran Wrap the entire springform pan an keep it in the freezer? Thank you! I would remove it from the pan and freeze wrapped up! Would you place in the freezer in the pan for two hours first so that it set and then remove the pan? I had trouble with the frosting. I made it twice. The frosting was too soft, became runny. Still was able to get it on the cake, but could not let it be set out of the refrigerator for too long. Did anyone else have this problem? I have cooked and named a lot. I could have kept adding powered sugar, but it would have almost doubled the sugar. Any suggestions? I plan to make it again in January for a birthday. Sorry, gave the wrong email address yesterday. I replied with the new one for other to answer. Thank you! I am a cake decorator and I think this looks wonderful!!! Can’t wait to try this recipe! I am looking forward to preparing this cake. It looks spectacular, and from the reviews, it’s delicious too. Is frosting spread between the layers to hold the layers together when iced? Hope I didn’t overlook this step as I skimmed over the directions. 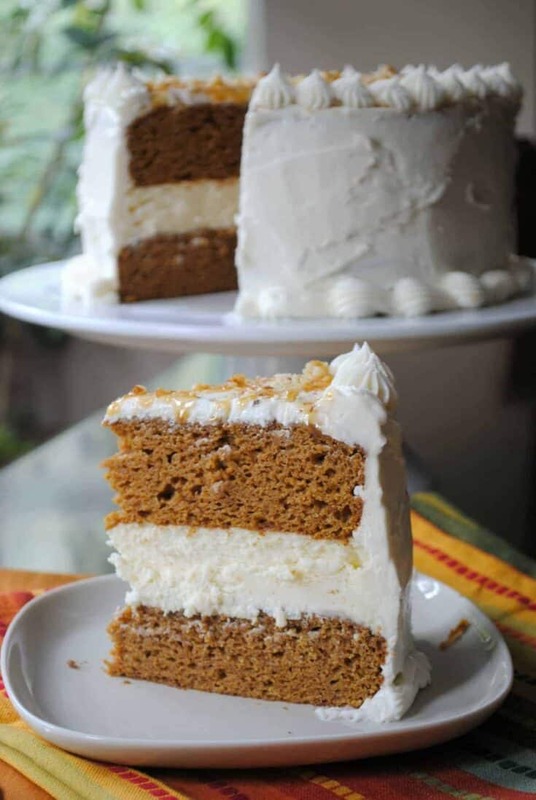 I just want to make the pumpkin layer cake and use the cream cheese frosting between layers and to frost it. It looks moist and delicious. Pingback: 50 Awesome Pumpkin Recipes - My Life, Blogged. I’m confused. 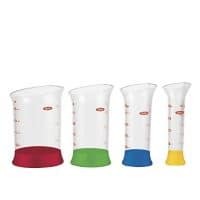 I’ve been baking for nearly 30 years, I AM a cake decorator hobbyist, and don’t know for the life of me why you’d use water around the bottom of a cheesecake springform pan. I never have. Besides, water boils at 212 degrees so because the cheesecake pan is surround by it, it won’t ever get warmer than that while baking even though the oven is set at 350 degrees. 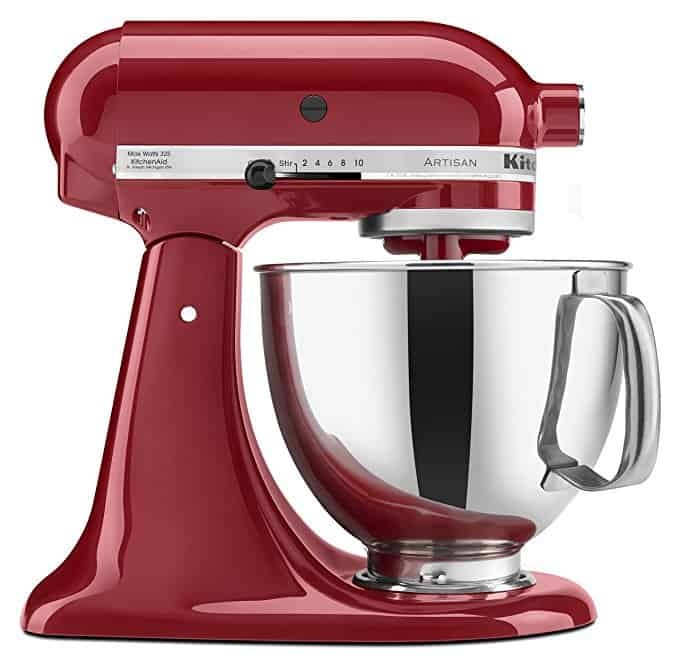 Are you TRYING to keep the temperature lower for more even baking? If so, why don’t you just bake the cheesecake at a much lower temperature? Doesn’t make any sense to me. what about a carrot creamcheese cake? So I made this cake tonight. It’s beautiful! The only thing is the cheesecake layer didn’t taste like cheesecake. It wasn’t creamy enough for me. I guess if it was the top layer would smash it and it wouldn’t hold up? Hmmm, I know there are a lot of flavors in this cake, maybe it got lost for you? I had another piece this morning. I definitely taste more pumpkin today! Maybe my taste was off yesterday? I’ll definitely be making this for the holidays! Thanks you?! I have what may seem like a dumb question. You mention putting the roasting pan on the bottom 2/3 of the oven. I have 4 shelves to my oven and usually bake a cake on the second from the bottom – does this mean the roasting pan would be on the 4th, the bottom shelf? Looking forward to trying out this version of the layering with cheesecake. I have made your red velvet one and it was outstanding!! It will definitely be on my dessert table again during the Christmas holidays. So for Thanksgiving, I know my family will love the pumpkin and cheesecake layered cake. Like all your recipes, it will be a delicious. This is just the most delicious cake! Perfect for fall an perfect for afternoon tea. It is hard to stop at just one slice! This cake looks absolutely tasty! I love the cheesecake layer and one slice won’t be enough! This looks like a delicious cake. I think it’s so pretty, even though you might not. Much better than I could ever do. I think my family would love this for dessert this Thanksgiving. I’m going to give it a try! I’ve never seen such a good looking cake! I can’t wait to try this! The combination of cake + cheesecake is perfection. Thank you for sharing this recipe. Cheesecake AND cake AND pumpkin? Swoon. This is the ultimate fall dessert recipe. Pumpkin cake and cheesecake are two of my favorite desserts. This looks spectacular, and I must make it as soon as possible! Yum! Love the idea of a cheesecake cake — why not have two desserts in one? Can’t wait to try this!